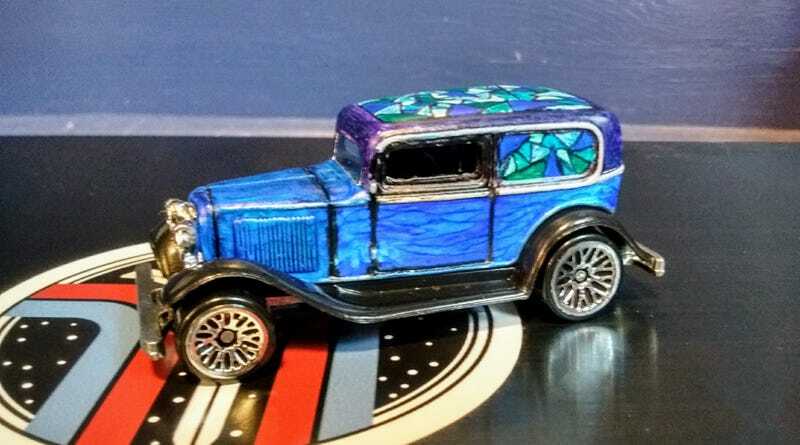 WIP - '32 Ford Delivery "Art Car"
VWJ, being the kind of guy he his, sent 2. One went in my long-roof display, the other went in my custom fodder pile and I finally got around to doing something with it. I sprayed it with white primer and then went to town with fine point Sharpies and Prismacolor art markers. The Sharpies worked really nicely for the line/detail work, but were crap for coloring large areas, which was when I switched to the Prismacolor markers, which have a nice kind of watercolor effect. Unfortunately, when I hit everything with clear, it was not super kind to the Sharpie. As you can see in the above picture, where I got the clear on kind of heavy (toward the back), it made the Sharpie start to run. It also made some of the silver Sharpie kind of disappear in places. The center line on the hood was silver before the clear coat. However, since the Sharpie goes on decently opaque, I think I can maybe just color over the less good spots on top of the clear and then go a little lighter with another coat of clear. The good news is that even a light coat of clear is seems to be enough to protect the Sharpie from a following heavier coat. My original plan was to do a wheelswap too, as I’m usually not a fan of the lace wheels, but I think they actually work pretty well with the look I’ve got going here, so they may stay. I’m definitely open to suggestions, though.